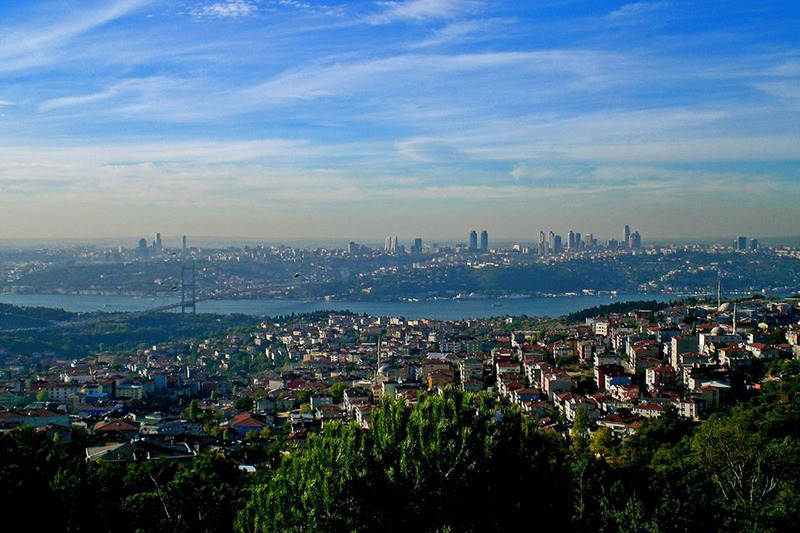 he great Camlica Hill stands about four kilometers east of Uskudar and can be reached by car. It is the taller of the twin peaks of Mount Bulgurlu, the highest point in the vicinity of Istanbul, 267 meters above sea level. It has a small teahouse in the midst of the pine grove which gives the peak its name. From here, there is an absolutely magnificent view, which makes it well worth the climb. In the morning when the sun is still easterly one has a panoramic sight of the whole city, the Bosphorus almost as far as the Black Sea, the Marmara Sea with the Princes Islands, and behind that, the great snow covered ridge of Uludag, the Bithynian Olympus. Toward evening the sun sets almost directly behind Istanbul and its domes and minarets are silhouetted against the flaming western sky like a splendid stage drop. Especially in the spring are these hills and valleys most beautiful, for everywhere is a profusion of the most varied wildflowers and many unusual birds.